The Commander-in-Chief Forum, with Hillary Clinton and Donald Trump, was televised Wednesday night. The Iraq Afghanistan Veterans of America, a veterans organization based in New York City, joined NBC and MSNBC in hosting the event. The Times adds, “The consensus afterward was not kind.” Among the harsher criticism of Lauer came from New York magazine’s Jonathan Chait’s evisceration of Lauer’s performance entitled, “Matt Lauer’s Pathetic Interview of Hillary Clinton and Donald Trump Is the Scariest Thing I’ve Seen in This Campaign”. I had not taken seriously the possibility that Donald Trump could win the presidency until I saw Matt Lauer host an hour-long interview with the two major-party candidates. Lauer’s performance was not merely a failure, it was horrifying and shocking. The shock, for me, was the realization that most Americans inhabit a very different news environment than professional journalists. . . . . Most voters, and all the more so undecided voters, subsist on a news diet supplied by the likes of Matt Lauer. Jonathan Chait is right to be scared. We should all be scared at the prospect that Donald J. Trump might actually be elected president of the United States. But don’t blame Lauer for not digging deeper into this danger. Complaints about Matt Lauer miss the point. The Forum was not a news event. It was a staged television performance put on by NBC, utilizing an audience of veterans on a set built at the Intrepid Sea, Air and Space museum aboard the decommissioned aircraft carrier Intrepid. Lauer has co-hosted NBC’s morning Today Show since June, 1997, a span of 19 years entertaining America with feature stories, interviews with star entertainers and news stories. NBC has an impressive team of news anchors and reporters who might have served as moderator of the Forum on the deck of the Intrepid Wednesday night. But Lauer has a morning audience and he is an NBC star. What he did with Clinton and Trump was to interview them as the stars they have become, catching them off guard when possible. Lauer has his share of news coverage experience but he was hardly the best interviewer to probe the candidates on ISIS, the Middle East, veterans’ health care, and the rising tensions around the world, all issues that affect the military and veterans. The Forum was billed on the Iraq Afghanistan Veterans of America web site as a program where the candidates would answer questions from veterans in the audience. Lauer did not even get into foreign affairs for the first 12 minutes of his opening 30 minutes with Clinton. Instead, no doubt with the blessing of his bosses, he rehashed the email “controversy” which NBC thought would interest its viewers. He also allowed Trump time to repeat his campaign lies against Clinton. Questions from military veterans were sparse in each half of the NBC Forum. It was not until Rachel Maddow took over the Intrepid stage for her MSNBC show following the Forum, that veterans asked their questions. This presidential quadrennial event is supposed to allow American voters to evaluate opposing candidates and select the one person best equipped to serve as U.S. President. It has worked fairly well since the first selection of George Washington. The election of 2016, however, has degenerated into a reality show designed to attract advertising sponsors, viewers, listeners and readers. The unexpected rise of Donald Trump entertained America in 2015 and 2016 with the encouragement of the media which profited from the reality show that is Donald Trump. The Republican Party was so weakened by the presence of a virus called the Tea Party, that it could not coalesce around one, two or three sensible candidates for President until the day the nomination was seized by a messenger of hatred and fear. They laughed when he first emerged. A few wise souls feared the worse, souls like Minnesota Congressman Keith Ellison who appeared on ABC’s This Week, with George Stephanopoulos, July 26, 2015. The presidential campaign was discussed. Ellison ventured his concern over the possibility that Donald Trump, with his campaign of hatred and fear, aimed especially at Muslims and Mexicans, might be elected president. Stephanopoulos thought such an assertion was ridiculous. Another guest on the show laughed in protest. After more than a year in a campaign for President of the United States, Donald J. Tump has displayed one talent: The ability to touch a strain of the American spirit which has fallen to a level of nativist distrust, hatred and fear of “others” of different races and colors. Our national media joined in the laughter in July, 2015. But true to its collective nature, that same national media could not resist allowing a man of such limited abilities to conduct a campaign of such deep fear and hate. The media knew a ratings winner when it smelled one. Pretending to be dismayed, the media gave Trump his stage to race to the White House. His lies were outrageous, but they were rarely sufficiently challenged. Ronald Reagan was a movie performer for many years before he became governor of California. Donald Trump, who is now close to being the second media performer to be president, does not have Reagan’s film and television stature. 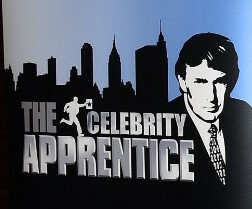 His career led him to one level of pop culture, as star of the television “reality” program, The Celebrity Apprentice, for 14 seasons. during which he “claims” to have received precisely $213,606,575. Trump was still under contract to NBC when he announced on June 16, 2015, that he would run for the Republican nomination for president. News of his termination by NBC appeared on August 13, 2015 in a CBS story, under the headline, “Donald Trump officially fired from ‘The Celebrity Apprentice'”. NBC’s entertainment chairman, Bob Greenblatt, announced Thursday while at the Television Critics Association Press Tour that the show would not be back next season, but will return in the future with a new host. NBC cut ties with Trump in June after Trump made comments about Mexican immigrants and NBC canceled its airing of the Miss USA pageant. One election away from the presidency, Donald Trump is asking America, “What have you got to lose”? The answer to that question should empower us all between now and November 8. This entry was posted in Donald Trump, Hillary Clinton, Media, Politics and Elections, Television. Bookmark the permalink. The American public are waking up. They have been duped once too often under the garb of “political correctness”. Donald Trump is a “politically incorrect” racist, bigot ? A false label that is beginning to lose its edge like the fake anti-semitism label that is used to silence truth tellers.The Enemy according to Trump is unemployment, outsourcing, “illegal” immigrants, wars abroad, neocons and free-wheeling allies like Saudi Arabia and Israel. Hillary is “a proven” corrupt, cheating, lying, warmonger, destroying millions of lives for the gain of a few billionaire allies who have the Clintons embedded deep in their pockets. Apparently, according to Hillary supporters. the Donald does not have enough blood on his hands to be President. Arlington National cemetery and other cemeteries are choked with graves of fallen soldiers. Vote for Killary, Vote for more body bags! How many heart-bleeding liberals approve of Hillary’s vote for the Iraq War, Hillary’s part in the invasion of Libya, Hillary’s story on events in Benghazi, Hillary’s support of Obama’s wish to bomb Assad’s regime, Hillary’s wish to agitate warlike confrontation of Putin in eastern Europe? Face it, in the days of Bryan and Kennedy, the Democratic Party was a party of honest money, the middle class, and foreign policy that minds our own business. But those days have been forgotten since the party fell for hot-button social issues, then lost its way. If Trump is as bad as the New York Times says, the Democratic Party let down the whole country this year in failing to nominate a responsible candidate for President as they could have done, and won the election. But, though he is not perfect, Trump is not as bad as the New York Times says as it speaks for Wall Street. The conversation between Bill and Loretta in Phoenix was not about grandchildren. Paul Wolfowitz supports Hillary who shares his values. And Trump is right in his overtures to Putin who is the greatest leader of Russia since Gorbachev and Alexander II. The United States should make an alliance with Russia, adopt a policy of friendly neutrality between Arabs and Jews in the Middle East, and join Putin in settling differences in the region. Correction: We should all be scared at the prospect that Hillary Clinton might actually be elected president of the United States. And so does anyone who recognizes that poking the Russian bear, rather than Trump the lion lying down with the bear, is playing with nuclear fire. You are right, Jim. And I appreciated the comments from Rep. Ellison. Thanks, Jim, not only for this column but also for publishing these comments from your “followers.” Certainly Donald Trump brings out the worst in all of us. And the choice that we face is truly worrisome, especially in the global implications of this election. But choose we must unless we are ready to abdicate all responsibility. The bottom line for me is that I am unwilling to cast my vote for the Republican party which is, itself, too divided to provide any coherent vision or leadership. The only viable alternative is to vote Democratic and hope for and expect that the checks and balances will provide some protection.